Major bull markets in gold are a fact of financial life, occurring 40% of the time since gold was floated in 1971. Gold entered a bear market in 2011, providing a tailwind for common stocks. This article presents three indicators likely to signal the next bull market in gold. Colleagues who share my interest in long-term trends have recently asked: Why so quiet on gold? The answer is simple. 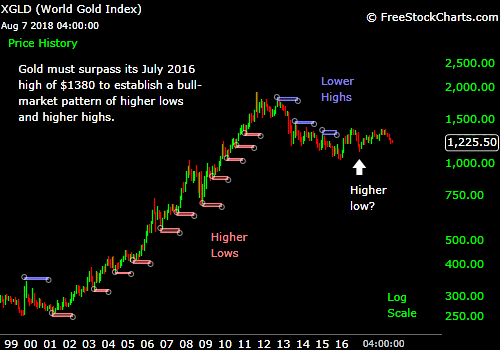 Gold entered a bear market in 2011, and has not yet established a major bull market. So what would constitute a major bull market? There are three hurdles by my reckoning. First, gold must surpass its July 2016 high of $1,380. This would mark the first higher high – following a higher low – since 2011. Higher highs and higher lows are the essence of a bull market. A market must stop going down before it can go up. 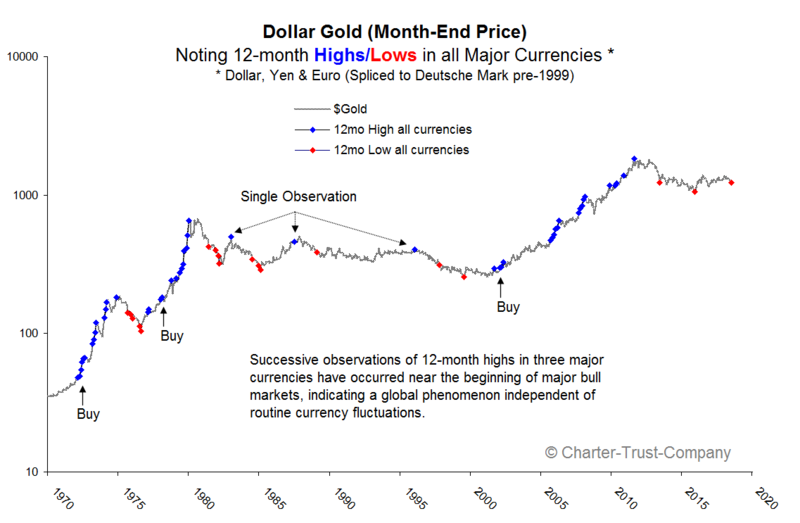 Second, gold must demonstrate long-term strength in all major currencies. The best bull markets have occurred after gold has achieved 12-month highs in the dollar, euro, and yen terms. Why should this matter? A demonstration of strength in all major currencies indicates a bull market of global scope, independent of cross-currency fluctuations. 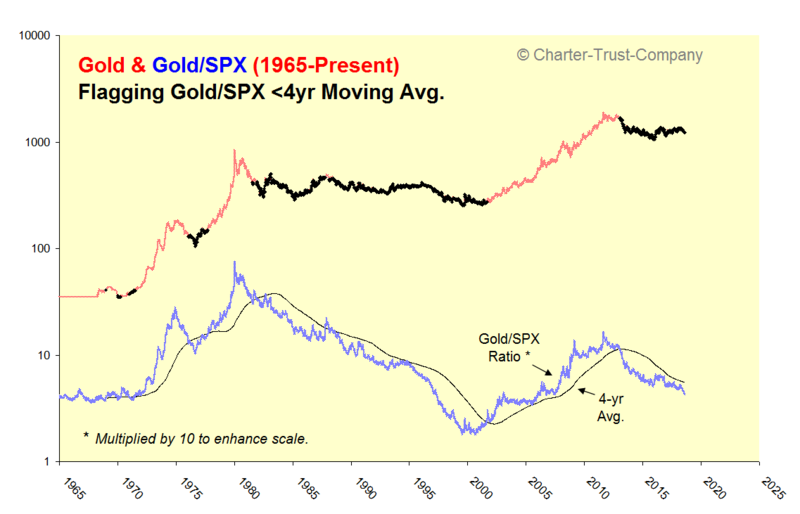 Third, gold must establish long-term relative strength versus the S&P 500. The best bull markets have occurred when gold has outperformed equities. This makes sense when gold is viewed as a measure of confidence in the institutions of money and credit. A loss of confidence in money (exemplified by the 1970s’ wage/price spiral) or credit (exemplified by the millennial credit boom and bust) favors the most senior monetary asset – gold – over the most junior claim in the capital structure – equities. Mainstream financial analysts tend to ignore gold. Gold is mentioned only once in the CFA Institute’s 85-page body of knowledge. But major bull markets in gold are a fact of financial life, occurring 40% of the time since gold was floated in 1971. Currently, a bear market in gold indicates confidence in the financial system. This backdrop is conducive to credit creation, a key driver of stock market performance. U.S. equities will eventually top out. But as history suggests, there’s no telling how far a bull market in financial assets can run. Gold is a polarizing subject. To some a barbarous relic. To others a noble truth. But gold is ultimately a measure of confidence – an important barometer of market conditions. Don’t ignore the message of gold. Watch patiently for signs of a turn. History will eventually repeat. Be prepared to favor gold when our three indicators change course.